There’s a hashtag coming to a screen near you: #PatientsNotAddicts. Its importance to the millions of people who suffer from chronic illness cannot be overstated. Words matter. Words are powerful. They can educate, but they can also blind. They can sway the opinions of millions of otherwise thoughtful and intelligent people through nothing more than simple repetition, even if the information they repeat is patently false. In a 1992 study by McMaster University researchers, it was shown that people give more weight to something they hear repeated over and over again, than something they have only heard once. People will do this even if the person repeating the information has proven untrustworthy in the past on multiple occasions. Repeat it often enough, and a lie becomes the truth. We see this all the time in life. It’s why advertising exists, and why politicians will never completely stop using negative campaign ads. Its how one discredited doctor was able to scare the daylights out of millions of Americans about the so-called dangers of vaccines, thus leading to a resurgence of diseases that had previously been all but eradicated, like measles and whooping cough. This same tactic is now being used against medications that give relief to millions of people who are fighting cancer and chronic illness: opioid-based painkillers. There’s no better way to ascertain public opinion on a subject than by Googling it. In this modern century of seemingly unlimited information, Google serves as society's mirror, reflecting back to us the truth of how we feel about any given subject. It’s not hyperbole to say that as Google goes so does the world, and this is especially true when it comes to the subject of opioids. A recent search of Google using just the word “opioids” found that 50% of the search results had to do with addiction and abuse. Only 4% of the results dealt solely with the proper use of opioid pain medication. It’s plain to see that media coverage on the subject of opioids skews overwhelmingly negative, and the average person researching the topic will come away with an equally negative (and unknowingly distorted) opinion of them. It’s this negative societal view that the CDC was probably counting on to divert attention from their covert attempt to issue new prescribing guidelines to severely limit the prescribing of opioids. The webinar they held on the subject last September was an invitation only affair. No press releases were issued, and the period of time allotted for public comment was a paltry 48 hours (which was laughable considering most of the public had no idea this was taking place). If not for the vocal pushback from the chronic illness community and organizations like the Washington Legal Foundation, these new guidelines would already be a fact of life for all United States citizens. Sadly, these guidelines are now the law of the land for our wounded veterans, as part of the $1.1 trillion spending bill passed and signed into law by President Obama last December. Taking opioids for pain does not automatically turn you into an addict, any more than eating M&Ms turns you into chocolate. Chronic illness may be invisible, but the chronically ill can no longer afford to be. That’s why #PatientsNotAddicts is important. Words are powerful and repetition can be a tool for the truth as well as for lies. 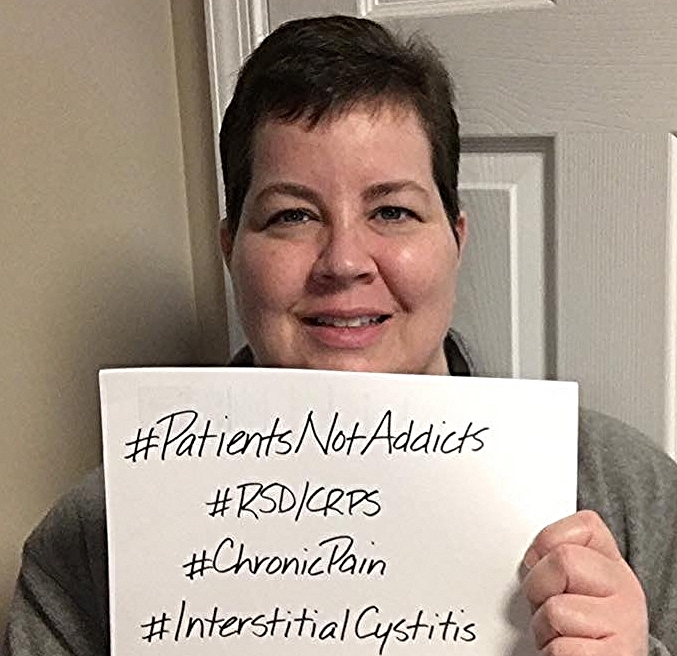 Using this hashtag can help remind everyone that pain patients are ordinary people. They are your loved ones, friends, neighbors and co-workers. What they want more than anything (except for a cure, of course) is to recapture just a small piece of the life they had before their illness took hold, before the never-ending pain of their condition destroyed the lives they had built for themselves -- lives that included careers, birthday parties, graduations, playing with their kids and being intimate with their spouses or significant others. For hundreds of millions of people, opioids help them do just that. To deprive them of that small ray of hope in the name of “protecting them” is nothing short of inhumane. I believe we are better than that, America. Prove me right. Ken McKim is an advocate for anyone with a chronic illness, and has made more than 43 videos on topics such as Crohn’s disease, lupus, depression, Ehlers-Danlos Syndrome, Complex Regional Pain Syndrome and much more. You can see his videos at Don’t Punish Pain and on his YouTube channel. Ken began advocating for pain patients when his wife was diagnosed with Crohn’s – and he came to realize that the chronically ill were often stigmatized by society. That realization led him to make a 32-minute video called "The Slow Death of Compassion for the Chronically Ill."